The Nuclear Magnetic Resonance Core provides equipment maintenance and infrastructure support of research projects that require NMR. Staff are also available for research support to investigators who want to use NMR for structural elucidation and study of chemical and biological reactions. Assistance in the design of experiments and spectral analysis is also available upon request. Instrumentation at the Nuclear Magnetic Resonance Core facility includes a Varian Inova 600 MHz spectrometer, a Bruker DRX 500 MHz spectrometer, an ARX 250MHz spectrometer and a DRX 300 MHz (widebore) spectrometer with solid state capability. All these spectrometers have multinuclear capability. 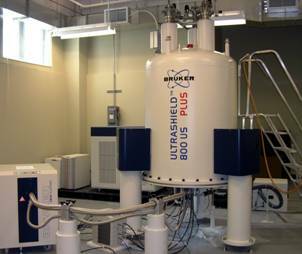 In 2008, a $2.1 million 800 MHz NMR spectrometer was added to the facility. This spectrometer is our newest instrument. This system has the latest and most advanced UltraShield Plus magnet with four-channel Avance III console, equipped with a 5-mm ATM (automatic match and tuning) TCI probe with cryo-chilled 1H and 13C preamplifiers; It has enhanced direct 13C-detection capabilities. The Nuclear Magnetic Resonance Core facility is located in room 125 in the Chemistry Building. The Core operates under the administrative umbrella of the Molecular Biology Program.